Mar 10Way to go, Frankie! Congratulations to Frankie Jones, our lucky winner of four Denver Nuggets tickets! Frankie Jones is a Colorado Native and is a big time fan of basketball. He spends his time coaching kids the fundamentals and techniques of the game. 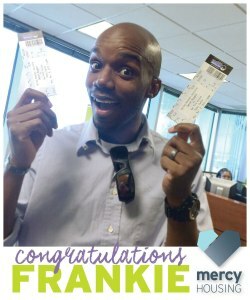 Frankie won the tickets through Mercy Housing’s social media contest. We asked participants to ‘Like’ and ‘Share’ our photo on Facebook, Instagram and Twitter. We want to thank the Denver Nuggets for donating the tickets to Mercy Housing. The game took place on Monday Mar. 9, 2015 at the Pepsi Center against the New York Knicks defeating them 106-78. Thank you for your support Frankie, GO NUGGETS!